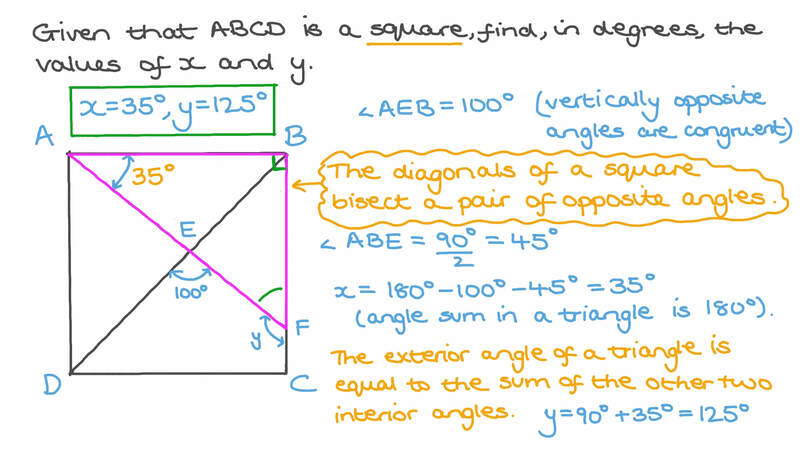 In this lesson, we will learn how to solve problems using properties of squares. What is the name for a rhombus in which one of the angles is a right angle? Given that 𝐴 𝐵 𝐶 𝐷 is a square, find, in degrees, the values of 𝑥 and 𝑦 . Given that 𝐴 𝐵 𝐶 𝐷 is a square and 𝑚 ∠ 𝐸 𝐷 𝐶 = 6 2 ∘ , find 𝑚 ∠ 𝐷 𝐸 𝐴 . Given that 𝐴 𝐵 𝐶 𝐷 is a square whose perimeter is 232 cm, find the lengths of 𝐴 𝐵 and 𝐶 𝐸 . Then find area of △ 𝐸 𝐷 𝐵 . Are the two diagonals of a square perpendicular? Is the sum of two consecutive angles in squares and rhombuses equal to 1 8 0 ∘ ? Which of the following statements must be true about a square? AAll these statements are true. BIt has two pairs of parallel opposite sides. CIt has four right angles. DIt has four sides of equal length. 𝐴 𝐵 𝐶 𝐷 is a square. What is the ratio of the lengths 𝐶 𝑀 : 𝐵 𝑀 ? 𝐴 𝐵 𝐶 𝐷 is a square. What is the ratio of the lengths 𝐴 𝑀 : 𝑀 𝐵 ? In the square of the figure, 𝐴 𝐵 is 160 cm long, what is the length of 𝑀 𝐶 ? Find the perimeter of the square 𝐴 𝐵 𝐶 𝐷 below, and determine 𝑚 ∠ 𝐸 𝐶 𝐷 if 𝑚 ∠ 𝐵 𝐶 𝐸 = 7 0 ∘ . In the square 𝐴 𝐵 𝐶 𝐷 the points 𝐵 , 𝐶 , 𝑂 a n d are collinear. Given that 𝑚 ∠ 𝑂 𝐴 𝐶 = 2 8 ∘ , find 𝑚 ∠ 𝐴 𝑂 𝐶 . Is the following statement true or false? In a square, all angles are right angles and all sides are equal in length. What is the measure of any angle in a square? In which of the following shapes are all the sides the same length? Does a square have right angles? 𝐴 𝐵 𝐶 𝐷 is a square. What is the ratio of the lengths 𝐷 𝑀 : 𝑀 𝐵 ? Are the opposite sides of a square parallel? Are any of the angles in a square 4 5 ∘ ? Are the sides of a square equal in length? What can you say about the diagonals of a square? AThey are perpendicular and equal in length. CThey are neither perpendicular nor equal in length. DThey are just equal in length. 𝐴 𝐵 𝐶 𝐷 is a square. What is the ratio of the lengths 𝐷 𝑀 : 𝑀 𝐶 ?